Please see the attached notice from the Park and Recreation Commission regarding the future of Rosemary Pool. Below are renderings reviewed by the Park and Recreation Commission in April 2016. Rendering 1 - Entrance to the 2nd Floor of the Rosemary Recreation Complex. Rendering 2 - Main pool and bathhouse entrance. Rendering 3 - View of Rosemary Recreation Complex from the far end of the pools. Rendering 4 - Birds eye view of the Rosemary Recreation Complex. Colored Site Plan of the Rosemary Recreation Complex including the building, pools, grass areas, and some of the parking lot. 1st Floor Site Plan of the Rosemary Recreation Complex including the pool function rooms (filter, storage, server), bathrooms, staff areas and pool entranceway. 2nd Floor Site Plan of the Rosemary Recreation Complex including the Park and Recreation Office, Health Department Offices, and Multi-purpose room. The Article 40 Report to Town Meeting is a report that details the project and the new design as it appears in the renderings above with the cost estimates detailed below. The new Rosemary Recreation Complex generates many questions. Please refer to the Frequently Asked Questions document to get answers to the most commonly asked questions! 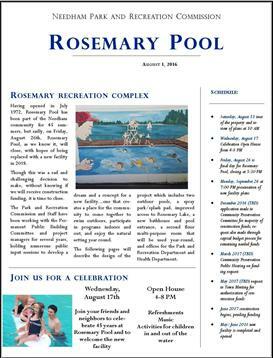 The Rosemary Pool Statistics from September 2015 cover general pool statistics from the last 5 years. In April, Chairman Dave DiCicco submitted a Guest Editorial about the Rosemary Recreation Complex Project. The Cost Estimates Overview from 04.11.16 highlight the general cost estimates and the soft cost estimates for the Rosemary Recreation Complex project.